*New Easel Design Pro Animation Lightbox with 16f Universal Pro Disc, with duel color corrected (pure white light) bulbs for 30w florscent light which is equal to 150watts of incondescent light. Footprint is 23" x 24"x 4". Our custom light is attached to the top and moves up and down with the top for constant even lighting. Our light is self contained aluminum box with (2) 15 watt color corrected bulbs attached to a single switch for bright white even lighting. The slotted lid support of solid maple will allow the top to be raised and lowered without fear of it falling or slipping out of the cavity carved on the base. 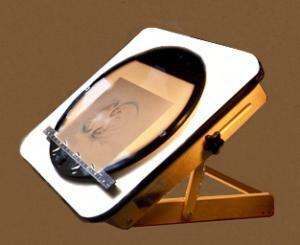 The New Easel Design adjusts to any angle up to approximately 45 degree angle without limitations. We also added Rubber feet to keep it from sliding while you are working. and can be quickly changed with the alternative set of pegbars. THE FIRST TRUELY UNIVERSAL ANIMATION DISC EVER. *Can be used with any fluorescent light source. *Top and bottom Plexiglas pegbars are 1.50" x 20"